In America, wedding favors come in many varieties – from flower seeds embedded in paper flowers to candles and bottle openers – and confetti consists of small pieces of colored paper that is thrown over the bride and groom as they leave the church or reception. However, in Italy, confetti means sugared almonds –something you would definitely not want to throw at the bridal couple – so when an Italian wedding planner asks you about confetti, please remember this! In Italy, the confetti, or sugared almonds (which should always be given in an odd number: seven or nine, etc.) are always included as part of the wedding favors. In recent years, it has become fashionable to do the “confettata” – here there will be a table laden with jars of sugared almonds of different tastes and colors. Paper cones or small containers are provided so that guests can choose their favorite confetti and take them home or enjoy them at the wedding. 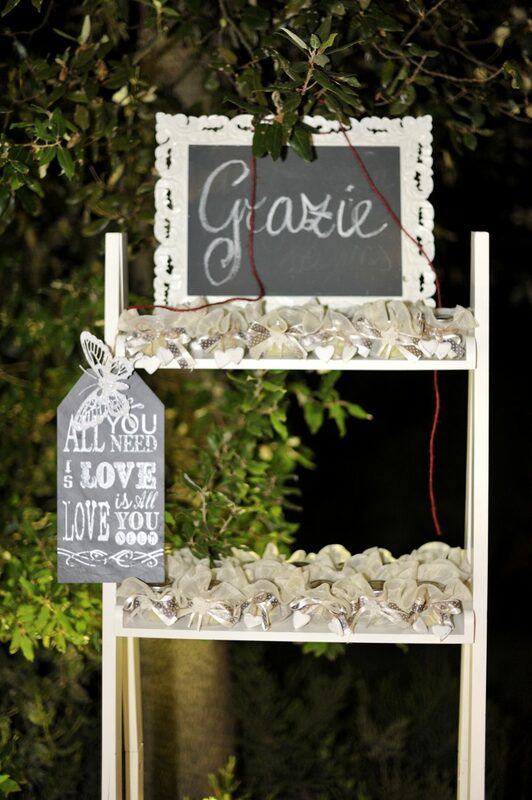 Together with the confetti, there will be many different sweets, candies and lollipops; and above the table you can have a decorative banner with romantic sentences, such as “Love is Sweet”, or instructions on how to take home the confetti. But of course, in Italy we don’t just put confetti and sweets in the wedding favors; as in America or any other country, the favors are remembrance gifts, or courtesy gifts to give to family and friends. At BeA Alfresco Wedding our favorite wedding favors are small bottles of olive oil, preferably filled with oil made by local olive farms. Often the wedding venue is also a farm which produces excellent oil – and being from Tuscany, I always try to promote them. We like to customize the bottles with a label bearing the name of the bride and groom, a special phrase or a ‘thank you’ for the Italian wedding gifts. We have learnt from experience that the bottles can contain not only olive oil, but many different kinds of liquids. We have had requests to fill the bottles with Limoncello (a lemon-flavored Italian liqueur), grappa (Italian brandy), or amaro (an Italian herbal liqueur). You can put any liquid into these small bottles, but the most important thing is that the bottles tell the story or the romance of the couple in a small way. Another very much appreciated wedding favor would be small soaps made with olive oil, which is also produced by many Tuscan farms. These olive oil soaps come in many different scents, such as orange, cinnamon, lavender and rose – and are very good for the skin.